There’s this program called ScreenSwish. Looks pretty nice, eh? Well, what’s the price? $69.99?! My gosh. Anyway, let’s check out who the publisher is. Download.com says ScreenSwish Inc. What’s their site? Flash-screensaver.net? Yeah, let’s open it. Server not found. Bummer. What if someone really wants to purchase it? Would you ever send money to a software vendor that submitted a program to Download.com in October 2007 and does not even keep the product site online in August 2008? I definitely wouldn’t. I guess you would never receive your registration key either if you registered the program using a service like RegNow, since the email address the developers use can’t be working anymore (there’s no DNS server assigned to that domain name). At least I can still download the latest release with no trouble. Oh, wait, there’s one more interesting thing. Programs like this usually use fake version numbers to make the users think they’re constantly updated. This one says 2.0 but I doubt there has ever been a 1.0. I even doubt there has ever been a different version. Let’s get back to the program itself. The installation process went smoothly. Now I’m excited to finally see what the program looks like. Hey, I know this program. It looks exactly like… what was the name? Flash Screensaver Converter Pro? Advanced Flash to Screensaver? Flash Saver Creator? Flash Screensaver Maker? Flash Screensaver Builder? Builder? Yeeah, I got it. It was definitely Flash Screensaver Builder. So let’s look it up to see what exactly happened to that one. Download.comâ€”Searchâ€”Flash Screensaver Builder… yeah, it’s still there (UPDATE: Great, Download.com guys seem to have finally removed this one, great job! It’s still available at many other download sites, though.). It says its developer is Dream-Soft. Let’s open Dream-Soft site. Wow, it looks pretty professional. Even though it’s most definitely just a template the publisher purchased. At least it still exists and seems to be offering a working way to register the product. Cool. According to Whois, the domain name dream-soft.org is owned by a Chinese guy Zhou Liang. Interesting, flash-screensaver.net was registered in China as well. Let’s take a look at what the program itself looks like. Yes, it’s totally the same thing as ScreenSwish, even the project files are 100% compatible, and the program version is… wait for it… 2.0! So that’s it. Two identical programs were submitted all over the download sites under two different names. It’s a pretty lame and unfair way to increase product sales. I kind of wonder why folks over there at Download.com did not find out earlier. I always thought Download.com was a software archive I could trust. And how does the program, well, programs, work? They offer a basic set of features but they’re extremely overpriced. The worst thing about them is that they’re buggy (like if you don’t have the ActiveX control of Flash Player installed, the screensavers created with them will freeze) and the vendors simply don’t care about updates. The same applies for another product: Eastsea Flash Screensaver 1.80 a.k.a. Icesun Flash Screensaver 1.90 a.k.a. 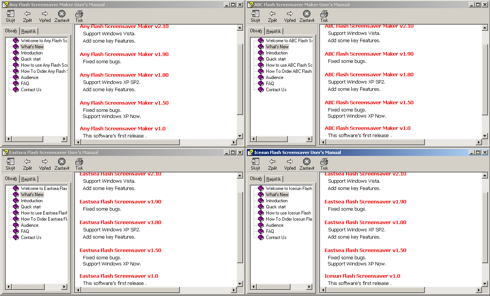 Any Flash Screensaver Maker 2.10 a.k.a. 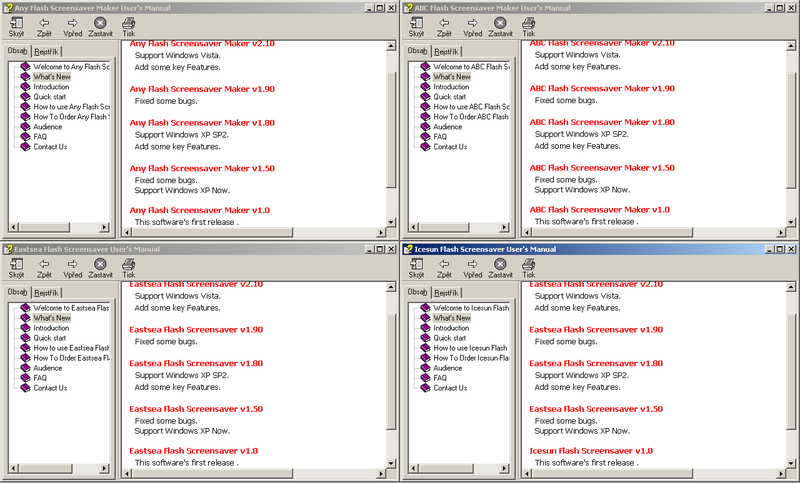 ABC Flash Screensaver Maker 2.10. Non-existent support, high prices, low value, they’re all available on tons of download sites and look exactly the same. What’s also weird about them is the fact that the programs have slightly different version numbers on the download sites. If you run these programs, they’re all 2.10, though. There may even be more than 4 programs like this, just try searching for a part of their usual description on Google. What’s the point of this post? Well, if you’re about to buy a new program, you’d better double-check its trustworthiness even when it’s presented on a well-known download site. As a software deveoloper I’m really disappointed to see this low quality software being promoted like real programs. As a computer geek, I run across all kinds of programs. Your InstantStorm is fantastic. No-one needs to pay for a screensaver builder program with your around. Thanks for putting it out there.